The sector deals with the art of delivering clean & conditioned air into living & working spaces. HVAC, expanded as Heating, Ventilation and Air Conditioning, is a key area in MEP engineering. This also forms one of the largest employment sector for Mechanical Engineers.In asssociation with ISHRAE, we deliver quality training programmes in HVAC engineering. We have carved a niche amongst the most dominant names in this domain, engaged in rendering HVAC CAD Drafting Service. 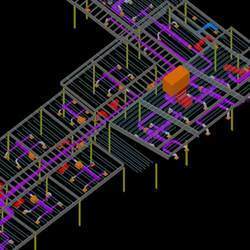 Hvac Systems Layout, VRV Layout with chiller pipeline design. 1.: Introduction and fundamentals of HVAC. 2.: Definitions as per ASHRAE. 3.: Terminology used in HVAC. 4.: Modes of Heat transfer. 5.: Study of Psychrometric chart. 6 Months programe (Theory + Practical).